According to the latest global study by International Data Corporation (IDC), the combined total market of smartphones, media tablets and PCs is now forecast to grow from 1.8 billion units in 2014 to 2.5 billion units in 2019. 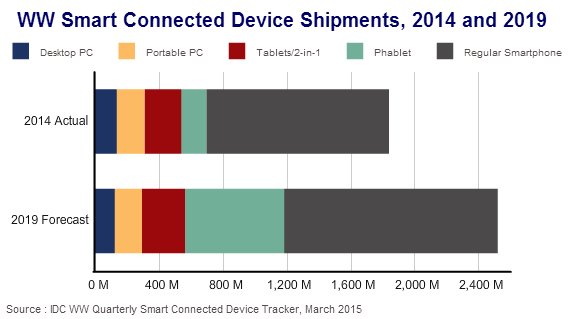 During the forecast period, smartphones will grow to represent the majority of total Smart Connected Device (IDC's term for the combined market) shipments -- dwarfing both tablets and PCs in terms of shipment volumes. As recently as 2010, PCs still made up the lion's share of the total device market, with the combined desktop and notebook categories accounting for about 52.5 percent of shipments, versus 44.7 percent for smartphones and 2.8 percent for tablets. However, by 2014, smartphones had grown to represent 73.4 percent of total shipment, while PCs had slipped to 16.8 percent and tablets had increased to 12.5 percent. By 2019, IDC expects the distribution to be 77.8 percent smartphones, 11.6 percent PCs, and 10.7 percent tablets. "Smartphone growth continues at an astounding pace, while growth in the PC and tablet markets is proving to be more challenging," said Tom Mainelli, vice president at IDC. "There are clearly some bright spots in both markets." IDC believes that detachable 2-in-1 devices will show strong growth potential in the tablets category, and convertible notebooks are beginning to gain traction in PCs. But ultimately, for more people in more places, the smartphone is the clear choice in terms of owning one connected device. According to the IDC assessment, not all smartphone growth will be equal. Going forward, the future of smartphones lies in emerging markets, sub-$100 price points, and phablets. In 2014, 73 percent of smartphones were shipped to emerging markets, 21 percent were priced below $100, and 12 percent had screen sizes between 5.5 and 7 inches. By 2019, these categories will all increase -- 80 percent of smartphones will be shipped to emerging markets, 35 percent will be priced below $100, and 32 percent will have a 5.5 to 7-inch screen size. So far the overall market has very much focused on premium models and brands, but emerging market consumers are looking for greater value from a single lower-cost (typically open-source Android-based) device. More likely than not, that single device will be an affordable smartphone or phablet -- they will drive mobile internet use in emerging markets. This emerging market trend will dominate upside growth in the foreseeable future.